There are over 2,000 described species of fleas. The most common domestic flea in the United States is the cat flea. If your dog or cat in New Jersey has fleas, they are most likely cat fleas. The adult cat flea, unlike many other fleas, remains on the host where feeding, mating, and egg laying occur. The dog flea is similar to the cat flea but is found in Europe, rarely in the United States. These two particular fleas are just two different species of fleas. Their names have nothing to do with their favorite host. In fact, the two flea species are so similar that an entomologist would have to look at them under high magnification in order to tell the difference. Cat and dog fleas infest many other animals besides our house pets including chickens, rats, opossums, raccoons, and foxes. Fleas live off blood and transmit diseases. Fleas are external parasites that live off the blood of the host mammals and birds. For cat fleas, the desirable hosts include humans as well as dogs and cats. 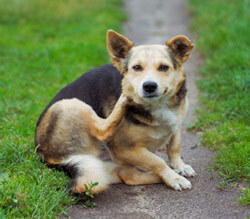 Fleas are a nuisance by causing a severe itching reaction. A dog or cat with fleas will attempt to remove the pest by biting, pecking, and scratching, often to the point where the skin becomes red and raw. Fleas can lead to hair loss from frequent scratching and biting and, in extreme cases, can cause anemia. But fleas are far more than an annoyance. Both people and pets can suffer from allergic reactions (flea allergy dermatitis or FAD) to flea saliva. Fleas are also disease vectors for diseases just like ticks and mosquitoes by transferring the diseased blood from one host to another. Fleas are capable of transferring variety of viral, bacterial, and rickettsial diseases as well as protozoans. The cat flea also transfers dog and cat tapeworms that can be transmitted to children. Fleas have been responsible for some of the worst epidemics in our world’s history. The bubonic plague was spread by fleas transmitting diseased blood from rodents to humans. Perhaps the only good news is that the deadly condition of heartworm disease in our pets is mosquito-transmitted, not flea transmitted. How can you identify a flea? Adult fleas are no larger than 1/8 inch long so it is difficult to see the characteristics used to describe them with the naked eye. To really get up close and personal with fleas, you need a microscope. These insects are reddish-brown and wingless with mouthparts adapted for piercing the skin and sucking blood. A female flea consumes 15 times her own body weight in blood every day. The insects are laterally compressed so they look as if they are walking on the edge. Their side-to-side flat bodies allow them to move easily between the fur and feathers of their mammal or bird host. Fleas have strong “thorns” and hooks on its head and thorax that help them stay attached to the host. Fleas are prolific breeders. Female cat fleas can lay about 20-50 eggs per day. Over her lifetime just one female flea can lay 2,000 eggs. One flea can multiply to 1,000 fleas in just 21 days. The eggs are pearly white, oval and about 1/32 of an inch long. They are smooth and fall from the host, landing on surfaces such as bedding and carpeting where the animal tends to rest or sleep. The eggs hatch in 2-5 days. The flea larvae are 3/16 of an inch long and wormlike with a distinct brownish head but no eyes or legs. The larvae feed on dried blood and excrement adult fleas produce while feeding on the pet. Flea larvae shortly build cocoons in which they pupate and develop into adults. The larvae develop more quickly at higher temperatures during the spring and early summer. At cool temperatures, fully formed fleas can remain in their cocoons for a year. What are the characteristics of a flea? Fleas are resilient creatures with amazing physical attributes for their size. Its powerful legs can shoot it seven or eight inches up in the air and fourteen inches sideways, a distance that measures 150 times their own size. They can lie dormant in all life stages; in lab studies, it appears that a flea can even be frozen for a considerable time and then thaw out as good as new. These resilient creatures are found on every continent including Antarctica and on virtually every bird and mammal. Fleas are found on polar bears and even on the world’s largest mammal, the blue whale, in their baleen plates that are used to filter food from water. Any structure can have a flea infestation. There is a misconception that only homes with pets can have flea problems. We have treated many infestations in homes without pets and even in commercial buildings. How do fleas get inside? Just like pets bring in fleas from the outside so can people. And fleas can be deposited outside the structure by feral cats living around and under the building as well as birds and other outdoor animals. If wild animals or birds enter your property, you are at risk for fleas. Humans can’t help but track in a flea or two as we come and go. In fact, if there is an inhabited structure, it is almost inevitable that there is some low-level flea activity; it’s just that a low background population of fleas doesn’t bother us. It’s when the population gets to unacceptable levels that we start to take notice – when pets are going crazy scratching and our ankles and calves have itchy bites. When that happens, you should immediately contact a pest control expert to inspect the problem at hand. The pet must be given a flea treatment as recommended by your veterinarian at the same time the house is being treated. It bears reminding how important flea treatments are for your dog especially during flea season when flea populations are at their highest. Today’s product innovations for flea control such as Frontline, Advantix, and others have made it possible to conveniently and safely prevent flea populations from building up on pets. These spot-on formula products are much more effective than the traditional insecticide collars, dusts, shampoos and sprays from years past. There are also systemic oral treatments to ask your veterinarian about. Preventative cat flea and dog flea control for your home starts with your pets, especially those pets that spend a lot of time outdoors. In order to effectively control an infestation, the fleas must be removed from not only from the pet but also the home. Removal of fleas from the pet is not enough. Immature fleas that have developed into adults and remain hidden in the rugs, carpeting, or outside will simply jump onto the pet and cause a re-infestation. It does help to shampoo the animal because it removes dried blood and skin flakes, which are food for the flea larvae. For effective control, the home must also be treated, primarily in areas most frequented by your pets as the eggs and larvae are developing there. Vacuuming is important to help resolve a flea infestation, but it is not enough. Vacuuming removes only eggs and food sources from the carpet. Larvae curl up around carpet fibers and pupae stick to the carpet. It is best to restrict pet access from areas hard to treat like crowded garages and work areas in order to limit the areas to be treated. Shed and dog houses should be treated at the same time. 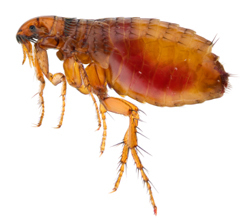 If you are concerned about cat fleas or dog fleas in your home, call or contact Cowleys Pest Services today for a free inspection and estimate. We offer pest control services throughout Mercer, Ocean, Monmouth, Middlesex County, including Toms River, Brick, Trenton, Piscataway, Old Bridge, Middletown, Princeton Junction and the surrounding area.